When sorting is enabled, the user can click on the column headers to control the sorting order. RadGridView supports three orders: Ascending, Descending, and None (no sort). Since R1 2017 columns have a property called AllowNaturalSort that defines whether the user will cycle through no sort when clicking on the header cell or whether once sorted the column cannot be "unsorted". 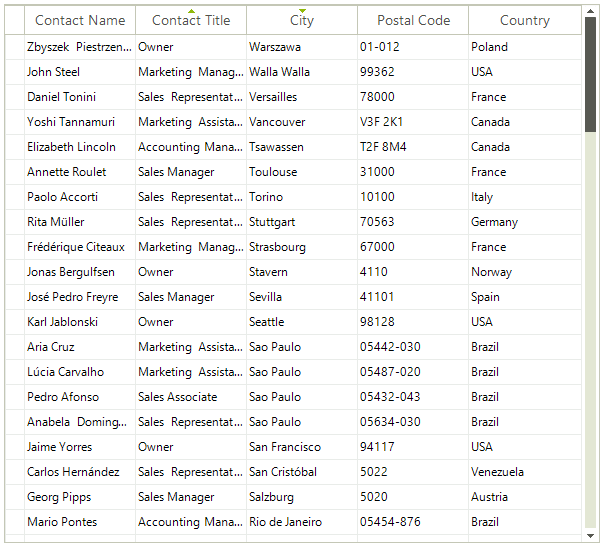 By default if the rows count is less than 10 000 we use quick sort to order the items. If there are more items we use Red-Black tree. This is controlled by the UseHybridIndex property. Dim sortOperator As String = ""
See End-user Capabilities Sorting topic about more information on the sorting behavior of RadGridView from the users' perspective.